One of the things that you really need for your garage is a smart garage door opener. It will not only make your work easier but it will ensure that the security of one of the most important spaces in your house is safe guarded. Well, different garage door openers come with different features. For instance, some come with their own garage door opener apps while others use third-party apps which can be crucial for your own security. Read on to find out more about the different garage door openers in the market today and some of their most outstanding features. It comes with dimensions of 4.5 x 4.5 x 4.5 inches with a weight of 8 ounces. It sends you notifications when someone goes in or out of your garage. It has Wi-Fi capabilities and can connect to a MyQ phone application. It comes with data protection capabilities. It allows you to schedule the garage to open at specific times of the day. It works with Google assistant, Nest, IFTTT, and nest. One of the most amazing things about this Wi-Fi garage door opener is the fact that it has very nice features to ensure your security is upheld. 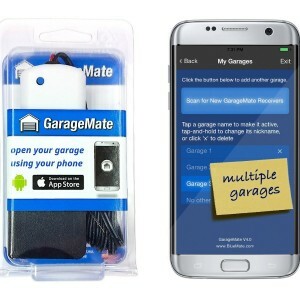 It sends you real-time notifications when your garage is opened and all the data that is shared through it is encrypted. All this is made possible by the fact that you can connect it to a phone app through any 2.4 GHz Wi-Fi. You can also connect it to other virtual assistants through its MyQ app although you will need to pay for subscriptions for some these services. It is small, lightweight and very easy to install and set up in any kind of garage. You get real-time alerts when someone opens your garage which can help you stop theft. It can be controlled remotely and away from since it is internet enabled and can connect to a phone. All the data that is shared through it is encrypted which is very important for protecting you from crimes like identity theft. You can schedule when you want your garage to open during the day which is very convenient for you in case you are busy. Its phone app can connect to other virtual assistants which will extend the number of ways that you can use it. It charges subscriptions for connecting to Google home of IFTTT. Its pre-closing tone is quite loud and there are no ways to control that. It comes with dimensions of 4x 4 x 3 inches with a weight of 8 ounces. 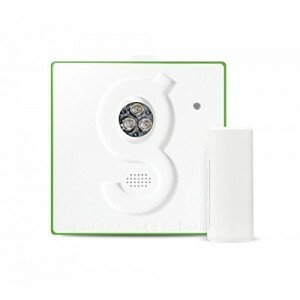 It sends notifications when the garage door or gate is left open. It connects to Wi-Fi and its application can be accessed from different platforms – smart watches, phones, computer and tablets. It is powered by the use of 2 AAA batteries. It can work for three doors at the same time. It allows for video recording and monitoring. Its application allows you to create up to ten user accounts. It is compatible with most IP cameras. It comes with wireless sensors, double-sided tapes, USB Wi-Fi adaptor, power adaptor, pre-assembled cables, and two controllers. If you want to control two or three important openings in your house then this is just the right smart garage door opener for you. It has the capacity to be used on three doors at the same time and in case you have different people using these doors. You can create accounts for them to be able to control the doors independently although you can set for them restrictions in terms of time, doors they can access and location. Video recording is allowed and you can access and control the garage door opener's application via different platforms giving you high flexibility when it comes to access. One of the issues that it has is that it restricts notifications and alerts on the gates to the accounts admin only. It can be used on multiple doors at the same time thus saving you costs of purchasing garage door openers for each garage door. You will get timely notifications anytime there is some activity involving your garage. It does not consume a lot of energy since it is powered by the use of batteries. You can view and record what is happening in your garage through videos from your IP cameras. It is very easy to set up and install. You can create user accounts for other people who also use the same garage doors and restrict the extent to which they can control the doors. 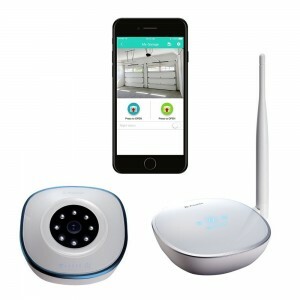 It is compatible with most IP cameras so you can connect it to the ones you already have. Only the admin can receive notifications about the gates. It does not work with Alexa. It comes with dimensions of 3.5 x 3.5 x 1 inches with a weight of 8.2 inches. It works with 2.4 GHz Wi-Fi to allow you to remotely control your garage door opener. It allows you to control your garage door opening through the use of mobile apps, voice commands and driving close to the garage. It sends you notifications when the garage door is open and offers logs on your garage for the last seven days. It is compatible with Amazon Alexa and Google assistant services. It allows for multiple user access. This garage door opener will afford you a totally different experience since it is quite flexible with its multiple control options. You can control it through a smartphone app or voice commands where you feel. It will also send you notifications when your garage door is open or closed so that you know exactly what to do. If you love working with virtual assistants then you will be glad to know that it can connect to booth Google assistants and Amazon Alexa. However, its major cons are that it can only work for one garage door and it does not come with the capability for video recording and monitoring. You can control your garage door remotely from anywhere in the world since it connects to Wi-Fi. It allows you some flexibility on how you can control your gate since you can open it via your smartphone or voice commands. You will get real-time notifications every time your garage is closed or opened and logs of your garage opening and closing. It works with your favorite virtual assistants like Alexa and other Google assistants to enrich your experience. You can allow your family members who share your garage to also access its controls since it supports multiple user accounts. It can only work for one garage door in case you have multiple doors you will need to purchase another piece. It does not come with video recording capabilities. It comes with dimensions of 2.5 x 1.5 x 0.5 inches with a weight of 3 ounces. It sends notifications when garage doors are open closed and also keeps logs. It uses Bluetooth 4.0 technology for connectivity. It can work through temperatures of between -40 degrees to 140 degrees F.
It works with Siri and can be compared to over 8 phones. 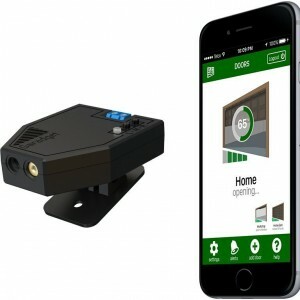 One outstanding thing about this garage door opener app is that it does not use Wi-Fi but employs the use of Bluetooth for its connectivity. I find this very important since Bluetooth is less vulnerable to hackers. It can also work in a range of temperature even the most extreme warm or cold temperatures. You will also love that it works with Siri and allows you to connect and control it from over 8 phones. However, it does not come with the capacity for video recordings which would have been very important for live monitoring of the garage. You can trust it to work even some of the most extreme temperatures which make it very reliable. It does not work with batteries so it will save you a lot of money when it comes to replacement costs. You will get timely notifications on the opening and closing of your garage door and you can look back at logs on the same. It uses Bluetooth 4.0 technology which is much more secure from hackers who might want to steal your personal information. You can connect to over 8 phones which means important members of your family who share the same gate can also get to use it. You can use it to open and control multiple garages. It does not support video recording and monitoring. It is powered by the use of two lithium metal batteries. It works with Wi-Fi connection and the myQ app. It is designed with a MED lift power system. It works with a super silent steel reinforced belt drive. 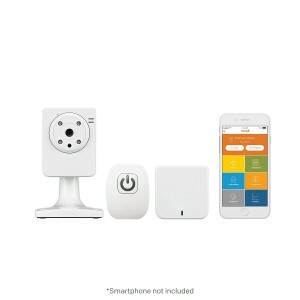 It connects and works with Nest, Wink, Xfinity Home. It is fitted with security features at both hardware level and software level. It comes in a package with three button remotes, dual function wall control, wireless keypad, safety sensors. You will love this smart garage opener thanks to its quiet operation and the ability to open even the heaviest doors effortlessly. Its belt drive is designed with smooth interlocking rails that do not make any noise. Lifting heavy doors effortlessly is made possible by it MED powerlifting system. Another feature that it comes with is its multi-control options which ensure you can control it using your smartphone, a wireless wall keypad or the three-button remote controls. If you would like a more enriched experience you can connect it to other platforms like Nest and IFTTT although for the latter you will have to pay some subscription fee. It sends you notifications when your garage door is closed or left opened. You can set schedules on it to outline the specific times that your gate can be opened or closed. It can work for even the heaviest garage doors as it comes with high lifting force for consistent performance. You can trust its belt drive to last for long as it is made of reinforced steel and it is also super silent during use. It can connect to other platforms like Nest to ensure that you have a more enriched experience while using it. You will love its sensors that are sensitive enough to prevent the gate from closing when there is something like a baby on its path. You can control it from the comfort of your phone or by using the three-button remote control that it comes with. It is very easy to install and set up. You get charged a monthly subscription fee to access the MyQ IFTTT channel. It comes with dimensions of 6.5 x 5 x 3.5 inches with a weight of 7 ounces. It is fitted with a very sensitive laser sensor. It does not use batteries. It has Wi-Fi capabilities and can connect with your phone through a phone application. It is capable of integrating with other home automation systems and other wearable technology. The Garadget Wi-Fi garage door opener is manufactured by a small company that is driven by simplicity. It does not use batteries and you will find it very easy to install given its simple features and small dimensions. You and other authorized family members can connect to it through a mobile phone and control it remotely. Something else that makes it very outstanding is the fact that you can use it together with other already existing home automation systems saving you from the costs of installation. However, its application is quite faulty when it comes to reporting on the exact position of the door. 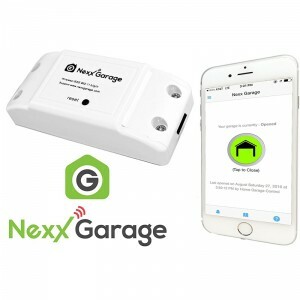 It sends you timely notifications when your garage gate is opened or closed which can help you note when your garage is still open so that you close it. You and family members who have access can control it remotely using your smartphone since it comes with Wi-Fi connection. It is very lightweight with small dimensions and so you will have a very easy time during its installation. You can easily connect it with your existing home automation systems hence eliminating the cost associated with installation. It saves you the cost associated with replacement of batteries since it is not powered by the use of batteries. The application that it works with is quite faulty when it comes to reporting on the garage door's position. It is quite difficult to get it to work with the SmartThings system. It comes with dimensions of 4 x 4 x 1 inches with a weight of 2.96 pounds. It has Wi-Fi connection and a phone app that allows for remote control. It allows you to control up to two garages using it. It is equipped with infrared night vision. It sends you notifications every time your door is open or closed. It comes with video monitoring capacity. It is fitted with a mounting bracket. This smart door opener comes in very small dimensions and so it will give you a very easy time when it comes to installation. You will love that it sends you push notifications every time the garage door is closed or opened and you are also able to monitor that garage door through videos even at night. It allows you to grant access to other family members who use it and you can use it open up to two doors at a time. However, you will have to purchase the sensor that it comes with since it is not part of the package and it does not have a mechanism to switch the device from normal mode to night mode automatically. You can control it remotely from anywhere in the world. It comes in very small dimensions which are very easy to set up and install. You can monitor your garage at night using it thanks to its infrared night vision capacity. 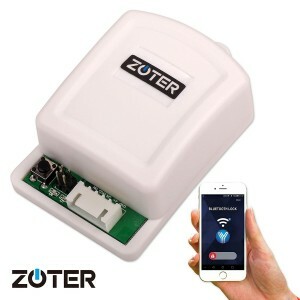 It sends notifications via email or text every time someone opens or closes the garage door. You can set it to grant access to use to other family members. It allows you to monitor your garage in real time through live images from a video recording. Its application keeps on being updated which goes on to affect a lot of the initial setup. The garage door sensor that it works with is not part of the package and so you will need to purchase it separately. You have to manually switch it form normal to night vision. It comes in dimensions of 5 x 1.5 x 5 inches with a weight of 1.4 pounds. It works with Wi-Fi and can be remotely controlled from a smartphone. It can be used on up to three garage doors. It allows for the scheduling of the time of closing of the garage doors. It uses a sensor to monitor the garage door position. This is one smart garage door opener that will save you a lot of installation costs since it can be used on three garage doors at the same time. You can control and monitor it from anywhere in the world and it allows you to set times at which your garage door can be opened. It also comes with a very accurate sensor that monitors the door position consistently and sends you updates on whether the door is left open or it is closed. However, one major issue that it comes with it that it takes quite some time to open the garage doors. You can control it remotely from anywhere in the world by connecting it to your smartphone. It comes in very small dimensions and is very easy to setup and to install. You can use it on up to three doors which minimises your costs of purchasing a door opener for each and every one of those doors. It is very efficient in monitoring the position of the garage doors whether they are opened electronically or manually since it uses sensors. You get alerts every time the garage is opened or closed and the logs of each user whether they are authorized or unauthorized. It allows you to schedule the time the garage doors will be opened and how long a door can remain open after being opened. It takes quite some time to open the garage door. It comes with dimensions of 3 X 1.9 X 1 inches with a weight of 1.6 ounces. It works with Bluetooth to connect to smartphone and tablets. It requires a connection distance of more than 10 m.
It uses app control for most of its functions. It makes a provision for use by up to 255 validated users. Its power consumption is just 12v/130m A. 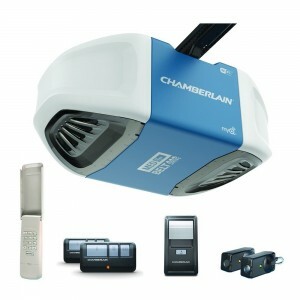 This is one smart garage door opener that can be very good for commercial buildings and residential apartments. I say this because it allows up to 255 valid or authorized users to connect to it and operate it from their smartphones. You will love that it uses Bluetooth and not Wi-Fi which is much safer to protect you from hackers. It also comes in very small dimensions that are very easy to set up and install. However, it only uses DC so if you will need to improvise if your garage uses AC power. It is quite small, lightweight and very easy to install. You can control it remotely using your smartphone via a Bluetooth connection which is much safer. It allows a large number of validated users access making it ideal for both offices and residential apartments. It is very energy efficient as it consumes very little power at a time. It uses DC voltage so it might not be of great help to you if your garage uses AC current voltage. It can open only one garage door at a time. It comes with dimensions of 7.5 x 4 x 4 inches with a weight of 2 pounds. Its monitoring is through the GarageShield system. It comes with a single Wi-Fi camera with night vision capacity. It can be attached to either a garage door opener or a wall switch. It allows for system expansion. It has Wi-Fi capabilities and runs on smartphones or tablets via the Oplink app. 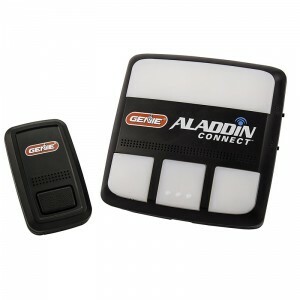 It has a motion detection capacity and sends notifications every time the garage is opened or closed. The Home8 garage door control comes with features built around its GarageShield system that makes it a truly smart garage door opener. You can connect to it via Wi-Fi and operate it through your smartphone remotely. It comes with a camera for video recordings and the camera can also be used at night since it comes with infrared capability. Motion detection is also one of the strengths that it comes with. System expansion is also possible with this garage door opener for a more enriching experience. However, its infrared is not that strong as it cannot effectively monitor very dark nights. You can watch what is happening in your garage in real time since it comes with camera for video recording. It is quite easy to install and also lightweight. You can connect it to your phone via Wi-Fi to enable you to control it from anywhere in the world. It is fitted with an efficient system that ensures smooth monitoring of your garage. You get a wide range of options for its installation since it can attach to a garage opener or a wall switch. 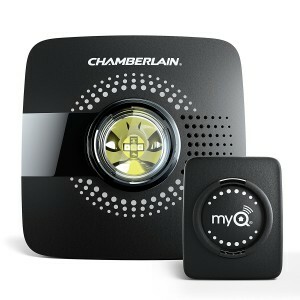 It can detect motion in your garage and send you alerts on the same which is vital for stopping potential crime. You can make additions to it via other systems for a more enriched experience in terms of operation and efficiency. Its camera's Infrared is not strong enough for areas with complete darkness.